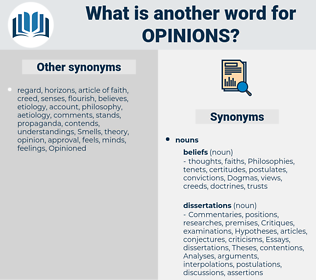 What is another word for opinions? positions, minds, determinations, decisions, stances, impressions, fatwas, Ideas. Perceptions, impressions, Suggestions, submissions, Beliefs, Ideas, remarks, exchange, Classes, notification. 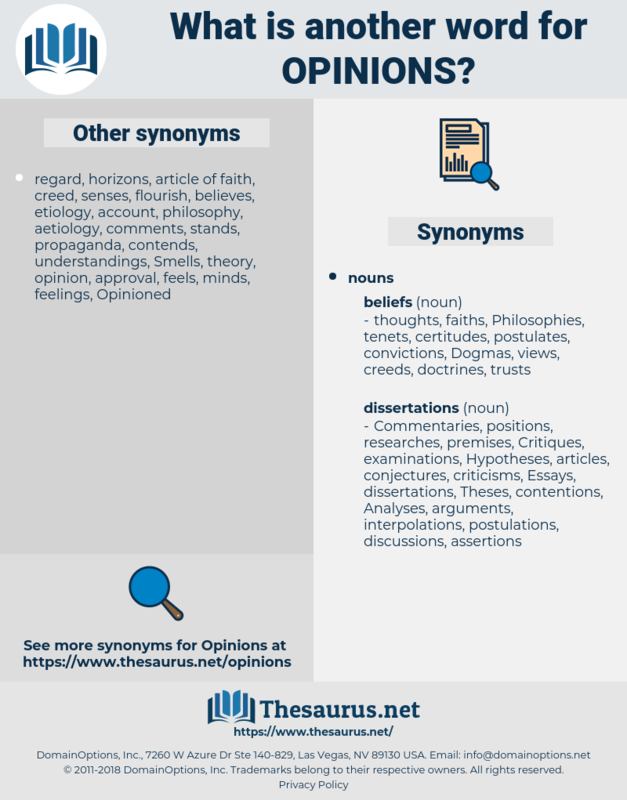 interpretations, Recommendations, notions, options, participations, propositions, appreciations, convictions, expectations, assumptions, conceptions, expressions, representations, instructions, polls, viewpoints, considerations, assertions, Consultations, Evaluations, persuasions, Publications, deliberations, reactions, Intentions, presentations, proceedings, interventions, prosecutions, discussions, Visions, reflections, explanations, points, allegations, invitations, standpoints, calculations, declarations, Sentiments, directions, Populations, manifestations, objections, reservations, judgements, Pensions, valuations, examinations, Aspirations, Regulations, Criteria, postings, commissions, situations, understandings, Judgments, thoughts, Opportunities, demonstrations, contributions, Philosophies, jobs, rulings, concepts, disagreements, destinations, divisions, questions, pronouncements, complaints, resolutions, Commentaries, assessment, assessments, Analyses, Motions, ambitions, inputs, responses, dissents, interests, doctrines, locations, Voices, advices, topics, statements, partnerships, newspapers, reports, verdicts, viewscapes, citations, worldviews, unions, Attitudes, Possibilities, solutions, requirements, appraisals, discrepancies, words, reasons, hopes, Advertisements, Perceptions, divergences, differences, expertises, Policies, faiths, advocates, Sensibilities, relationships, arguments, criticisms, Respondents, participants, proposals, senses, regards, commentators, concerns, people, POVS, bulletins, sensitivities, experiences, notes, estimates, judges, posts, insights, belonging, Guidelines, noises, trials, papers, disclaimers, stops, choices, express, rumours, approaches, disputes, grounds, Postures, relations, documents, speeches, PROSPECTS, heading, headings, respects, warnings, reviews, ratings, experts, placements, outlooks, stocks, politics, lawsuits, journalists, alternatives, orders, tips, Records, inflows, matters, processes, appeals, committees, Discoveries, terms, values, feedbacks, Replies, issues, utterances, eyes, things, jugements, wishes, letters, Specialists, Tendencies, messages, sentences, needs, favors, desires, lookouts, forecasts, Posters, Roles, boards, ballots, draftsmen, PORTS, benchmarks, fronts, Vacancies, Surveys, phrases, reflected, ways, amendments, demands, seats, updates, Paths, advisers, reserves, reflects, chances, Stories, hearts, sounds, Suggestions, CENTS, answers, claims, aspects, backgrounds, cards, internal, sides, designs, sights, Feet, Languages, accounts, exchanges, critics, lyrics, item, items, Difficulties, Emitted, counts, accords, cases, Theses, Ones, dots, checks, currents, Angles, Cries, individuals, marks, places, flows, data, Cultures, alerts, streams, councils, Areas, Entries, Standards, calls, see, vues, media, groups, degree, causes, guys, paragraphs, similarities, cultural, Guns, Tales, stands, returns, Vistas, heads, 59, submissions, Beliefs, members, results, LINEs, remarks. Opined, Commented, perceived, considered, Concurred, advised, Speculated, characterized, suggested, Believed, Submitted, reasoned, Argued, understood, concluded, underscored, Contended, asserted, agreed, felt, found, identified, Indicated, alleged, maintained, satisfied, stated, thought. Consulting, Advising, posting, Suggesting, believing, saying, feeling, Notifying, thinking, according, Tabling. advises, suggests, believes, submits, determines, argues, feels, cautions, contends, asserts, agrees, Deems, thinks, finds, views. We often find Englishmen in India, and I suppose in all the rest of our foreign settlements, sporting high Tory opinions and feelings, merely with a view to have it supposed that their families are, or at some time were, among the aristocracy of the land. He looked at the third man, who promptly said: " Opinions!"